I finally finished a swap that I've owed for a year and a half. This swap was through one of the first online groups that I joined. 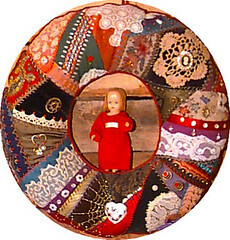 We have shared our lives and love of dolls for many years now. I was supposed to make a birthday outfit and accessories for an American Girl doll. 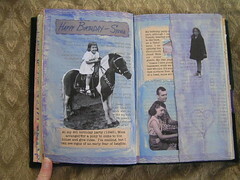 I wound up making an altered book all about the birthdays of the members of our list and the birthdays of the different American Girl dolls. I also knitted an outfit for the doll. This is one of the pages from the book. To see the rest of the book go to my Flickr account. This link will take you to the cover. Just click on next to see the other pages.